Summer truly begins this week. The windows are wide open….the birds are singing….. and enjoying a wonderful lunch out on the patio with my father on father’s day a beautiful cardinal stopped by to sing a song for us. We have kits of these singing beauties. To add a little drama to our lives….. “It’s all about Me”! We have kits What a diva and if everyone around us would just truly believe we’re diva’s, it would go so much better for them. She does make you smile. We have kits. 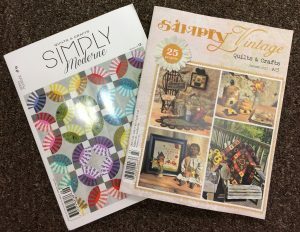 New issues of Simply Vintage and Simply Modern Quilting magazines are here and filled with wonderful ideas to create. There are so many in Simply Vintage I don’t know where to begin. 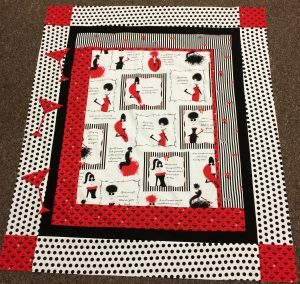 Patterns for the Watermelon are in and this runner will compliment any summer table without adding calories to your meal. Quick runner to make and display for summer Fun and fresh. 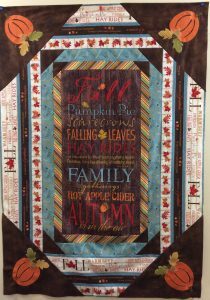 I’m seriously not wishing my summer away, but a new Fall quilt to make up now so when the season arrives you are ready with a fresh new quilt. 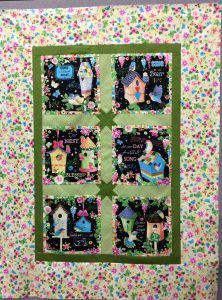 The pattern doesn’t call for the corner pumpkins, but I simply love applique and couldn’t resist. We have kits. It’s the final week of the Wisconsin State Shop Hop which ends on Saturday. The weather continues to be great for traveling around so take advantage and see all there is to see with so many great displays and ideas in each shop. The bears are moving around looking for their berries so Strawberry season must be upon us and there’s a cute Strawberry pin cushion in the Simply Vintage magazine I’ll be working on. It’s just so dang cute. If you don’t need another pin cushion….turn it into the center focus of a table topper. Enjoy your week…sing to your plants it will make them happy and swing in when you get a chance.